Take Advantage Of Our Exclusive Pixie Faire Bonuses: We are honored to partner with Hearts For Hearts Girls and as an exclusive buyer bonus we are including a starter set of HFHG sized patterns, and of course, Pixie Points! Offer valid while supplies last so act today! More About Nahji from India: Experience life in colorful India with our Nahji doll, the smart and determined girl who dreams of a better life. Her brown eyes gleam with amber glints and her hair is a sweeping fall of rich coffee brown. She is 14 inches tall, has high quality rooted hair, and has a poseable smooth vinyl body. She is similar in size to a 14.5" WellieWishers doll as well as a 13" Les Cheries doll. Nahji is a smart and determined ten-year-old girl from Assam, India. In her community, girls go to work and marry very early in their lives, but Nahji wants something more. She convinces her parents to let her go to school. She learns how to help her family create their own garden market. She starts raising Indian runner ducks. And she visits local 'tea clubs' to encourage other girls to take charge of their own lives. She tells them, “When you believe in yourself, when you are strong in your heart, then you can change the world." About Hearts for Hearts Girls Dolls: Our dolls are inspired by stories of real girls from around the world. Each doll tells a story of a little girl’s journey to succeed and create a better life for her family, her community. Each doll is carefully designed and dressed in a quality, authentic outfit that represents her country or specific region. The Hearts for Hearts Girls mission is to invite girls to become agents of change in their communities, their country and around the world. To support our mission, Hearts for Hearts Girls will donate one dollar ($1.00) from each doll purchased to our charity partner, World Vision, for programs that support girls around the world. Hearts for Hearts Girls also offers a fun, kid-friendly website with more information, character stories, crafts, and activities. Discover the other beautiful Hearts for Hearts Girls dolls and their stories: Nahji (India), Consuelo (Mexico), and Dell (Appalachia). Together we can change the world one heart at a time. Liberty Jane No-Sew Janes Shoe Pattern: The sun is out and your 13-14” doll will be ready to greet her friends wearing these fun slip on shoes. There are so many options of packaged trims to choose from when making shoes from this NO-SEW pattern; cotton lace, embroidered trim, or crocheted trim will all work great. You just need a style that is at least 2 inches wide and has a straight edge along the length of the trim. A variety of lightweight woven cotton fabrics can be used for the shoe lining. This pattern uses SHAPE 2 Pre-cut shoe soles. Forever 18 Inches Cardigan Pattern: The Classic Cardigan: Timeless, versatile, appealing…what’s not to love? This pattern has been several years in the making. It began with a desire to recreate an authentic-looking cardigan with off-the-bolt knit fabric, but despite several sincere attempts I couldn’t find a solution that really satisfied me. Everything changed when I was introduced to the concept of the Hong Kong Finish! The look of this sweater can be changed dramatically with fabric choices, sleeve length, neck style, and contrasting (or not) binding.This PDF sewing pattern will fit 14-14.5 inch dolls such as Hearts For Hearts and WellieWishers. Genniewren Serena Skirt Pattern: The Serena swirly skirt is a funky, modern spiral-gored skirt with real “twirl factor” that’s perfect for your 14”-14.5”” dolls such as WellieWishers™ or Hearts For Hearts® dolls. The Serena Swirly Skirt design allows your imagination to run riot by mixing and matching colors, prints, plains, stripes and checks and trims. You can use a different fabric for each gore as shown on one of the cover examples, or you can alternate panels from using two different fabrics as in the fit and flare skirt. The choice is yours! A Little Knitty Olivia Ear Warmer Knitting Pattern: This pattern includes a design for girls & their dolls, so they can look cute and stay warm together this winter! It's a simple pattern that is a quick knit. Seed stitch pattern on ear warmer is super stretchy and comfortable. This pattern fits girls (ages 3- 10) AND 14 - 14.5-inch dolls such as HFHG and WellieWishers and 16" A Girl For All Time® dolls. Pixie Points: This purchase comes with 390 Pixie Points, which you can use to get even more fun doll clothes patterns for Hearts For Hearts Girls dolls. I am very pleased ,she is adorable and I am excited to start making clothes for a smaller doll .Very high quality ,her hair is extremely soft and she is very well made. The pictures really do not do Nahji the justice she deserves. This doll is so much prettier in person. Her hair is soft and silky to the touch. The outfit is adorable. She's so cute, such a great deal compared to some other brands. Packaged very well for shipping too. 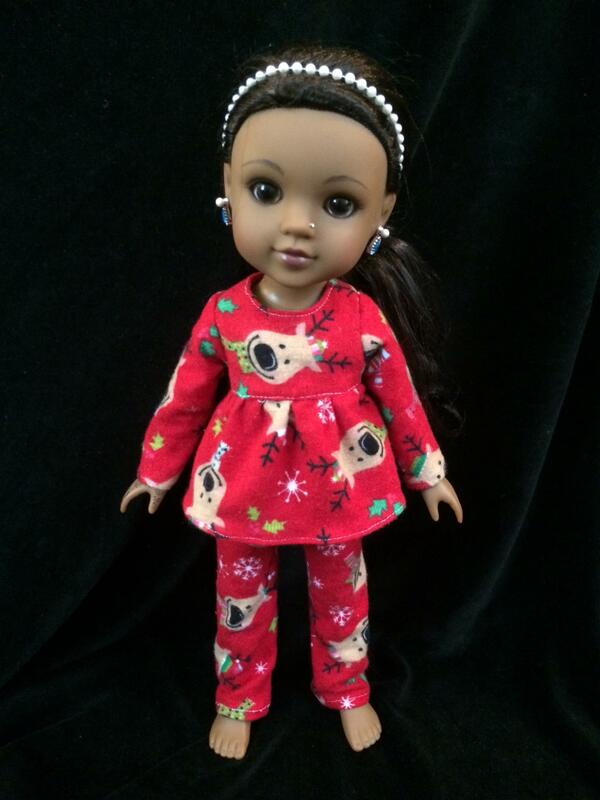 I love this doll, my granddaughter Maya will love her as I bought it for a Christmas gift. I am very pleased with the quality of the doll, she is beautiful.